The enzymes in CANNAZYM have many benefits: They turn dead roots into minerals and sugars. This is important, because these minerals and sugars make up a valuable source of nutrients for the plant and micro-life. It improve the uptake of nutrients and the plant’s defense system. Also, vitamins stimulate the production of hormones. They help form new roots. The easy-to-absorb vitamins in CANNAZYM also stimulate the plant to form new roots. This increases the health of the plant. 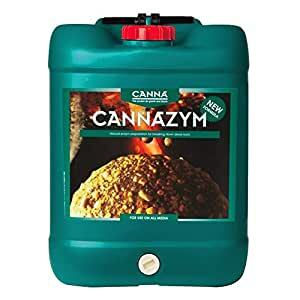 CANNAZYM prevents bacteria and harmful mold. Dead roots form an ideal environment for molds. They are a threat to the healthy roots. The molds cause stress to the entire plant and stunts any new growth. Also, CANNAZYM prevents rotting, so there is no formation of toxic substances and the risk of a disease is considerably reduced. CANNAZYM improves the soil environment. A fast breakdown of root remains creates a balanced hydrological regime and good aeration in the root environment.